Either that, or people are really feeling this Mercury retrograde. If you've been anywhere near Twitter over the past two weeks, chances are that you've seen the incredible meme of a color guard squadron fiercely teaching the internet how to get all the way down to Fleetwood Mac's "Dreams." 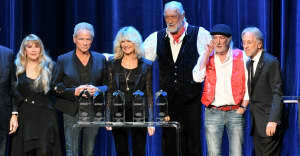 According to Billboard, that very tweet has rocketed the 1977 Rumours classic to number 16 on the Hot Rock Songs chart. The viral meme reportedly kicked off a 36% uptick in download sales for "Dreams," and a 24% rise in on-demand streams (up to 1.9million). Those are quite significant jumps for a track that came out over forty years ago. Thunder truly only happens when it's raining.